Design :- The pouf cover is designed using timeless classic motif & patterns & giving them a contemporary look with fresh bright colour palette. 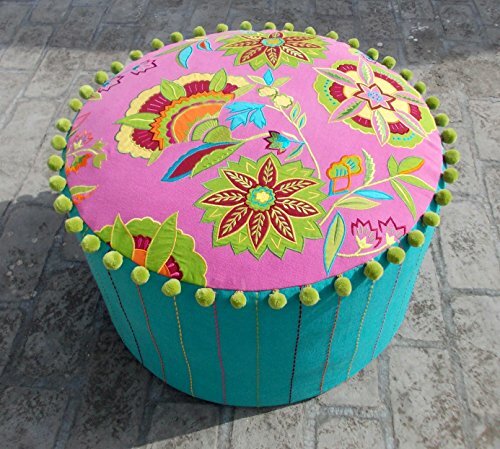 The intricately embroidered & appliqued pouf cover is made in 100% cotton. Color: Top has bright pink base with multicolored applique and embroidery, Sides are in Turquoise with multicolor rice stitch, Pom Poms - green. The pouf cover has zip closure at the bottom. All inside seams are lined and finished for no fraying. This listing is for the cover only. You can find the XL pouf inserts at most craft stores. If you have any questions about this product by VLiving, contact us by completing and submitting the form below. If you are looking for a specif part number, please include it with your message.